The Bengard family started out as true pioneers in the Salinas Valley. In 1855, James Bardin traveled across the Great Plains to California by covered wagon, searching not for gold but for rich farming and grazing land. Wes Eade also came to California in the 1880’s to farm and raise cattle. This heritage led to Tom and Terry Bengard, the grandchildren of James Bardin and Wes Eade, establishing Tom Bengard Ranch in the 1960’s. To start, Tom farmed sugar beets, small white beans, potatoes and Spring lettuce on the original home ranch. Having a strong work ethic, he did most of the labor himself which included driving tractors, planting, irrigating and shop repairs. As Tom accrued more acres, he transitioned into row crops. While he was busy in the field, Terry managed the bookkeeping and together they successfully grew the Ranch. The next step involved packing and shipping produce using their own label, which they began in the early 1970’s. Tom packed iceberg lettuce in BENGARD, BARDIN, BENGI, and ON TOP cartons. These labels, along with KLEEN HARVEST, are still used today. With the help of essential employees like Lino Finatti, John Harrington, and the next generation of Bengards, the company grew exponentially. Throughout the years, Tom acquired additional land and formed many key partnerships while venturing into several different commodities and growing regions. He retired in 2000, passing ownership to Bardin Bengard, Tom Bengard and Tracy Pezzini. 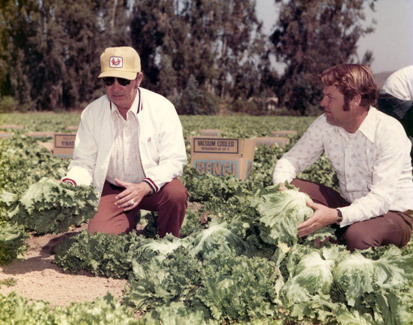 Today Bengard Ranch is one of the largest grower-shippers in the Western United States, farming in California and Arizona with extensive operations in Mexico and Florida.